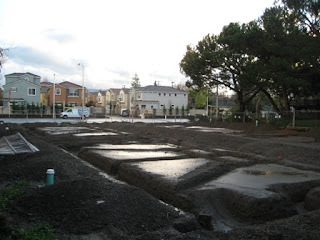 Not sure if there was an official groundbreaking ceremony for new Santa Clara’s eight townhouses by Rockwell Homes, on the lot previously occupied by Biryani Junction and BBQ restaurant located between Oakridge apartment complex and Chevron gas station and service center. Not long ago the 2,000 SF building at 3625 Pruneridge Avenue, Santa Clara served as 7-Eleven, a little bit later as Quick Grocer convenience store and finally gone after being nice restaurant for a few years. As you can see from the picture taken from the corner of Chevron premises toward Enclave Santa Clara the work has started. One of the strength of a new small Rockwell Homes community is location within Cupertino Union School and Fremont Union School Districts. Kids will attend Eisenhower Elementary school (API 893), Hyde Middle school (API 829), Cupertino High (API 817) together with children from Enclave Santa Clara single family homes. Enclave is Single Family Community which does have only four townhomes. The Author has mentioned it as Townhomes instead of Single Family Homes. I would like to know the price for these Townhomes. No one will offer the information when I ask Rockwell Homes etc. I am curious. They just lowered the pricing to $600K for these which is considerably more reasonable than the $640K they were originally asking. I would say it could be an interesting choice between brand new townhouse in Pruneridge Villas with $240 HOA dues near Lawrence Expressway or fixer upper home on huge 10,725 sq ft lot at quiet Rancho Rinconada neighborhood.